Dubai, United Arab Emirates: Microsoft today continued its GITEX Technology Week 2016 theme of “An Empowered Future”, with the introduction of its hyper-intelligent Dynamics 365, the cloud-based customer-relationship management solution that gives organisations of all sizes access to the most advanced AI tools ever seen in a business application. The Dynamics 365 cloud service brings together a number of purpose-built apps, each designed to address a specific business need, such as sales automation, operations or customer service. In the best tradition of cloud computing, customers pay only for what they use, but the functionality of Dynamics 365 can expand as soon as the business requires it. Powered by advanced analytics and machine learning – the result of billions of dollars of Microsoft R&D over multiple decades – Dynamics 365 brings together a suite of artificial-intelligence (AI) capabilities that can be used to improve manufacturing and supply chain execution; make field-service operations more efficient; sell more effectively; and create standout customer experiences. 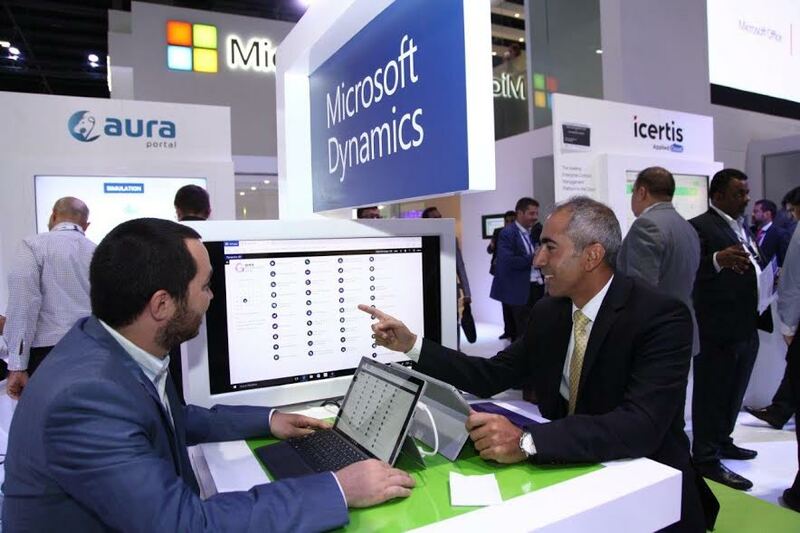 GITEX 2016 visitors were able to get hands on with Dynamics 365’s built-in intelligence capabilities, which include sentiment and intent analysis; pre-emptive service provision; demand forecasting, lead and opportunity scoring; product recommendations; and up-sell and cross-sell functionality. Microsoft is confident that delegates will discover capabilities in Dynamics 365 that they thought scarcely possible in mainstream business applications. Dynamics 365 customers can extend the core application’s intelligence capabilities, through independent apps that provide targeted and domain-specific intelligence. For example, Dynamics 365 for Customer Insights, an analytics app launched last week along with the main cloud service, brings together Microsoft data and that of other CRM, ERP, Web, social and IoT sources, and applies AI modules to it, to provide a 360-degree customer view with automatic suggestions on how to improve engagement. Dynamics 365 also allows customers to define their own roles for end-users, for the purposes of role-based data access. A sales executive need only have access to customer history, whereas a C-level manager would require a broader, top-level view of the entire business. Dynamics 365 puts control of these requirements firmly in the hands of the customer. Dynamics 365 takes full advantage of the capabilities built into other Microsoft apps, such as Power BI, Office 365, Microsoft Azure and Cortana Intelligence. It uses a newly developed, Common Data Model that allows its customers to extend functionality and build their own custom apps using PowerApps, Microsoft Flow or Microsoft’s professional developer solutions. Since Microsoft’s ISV partners use the same Common Data Model in their solutions, customers can pursue the ideal solution for their individual industry needs, by bespoke extension of Dynamics 365, or by browsing the many function-specific apps found in AppSource. Dynamics 365, along with many of the aforementioned features, will be available in more than 135 markets with support for more than 40 languages, from 1st November. The solution comes in Enterprise and Business editions, to cover all scales of organisation. Dynamics 365 offers subscription schemes priced on either a per-app or a per-user basis, and introduces industry-first plans that reflect the many ways industries, organisations and employees work in the digital age. Microsoft (Nasdaq “MSFT” @microsoft) is the leading platform and productivity company for the mobile-first, cloud-first world, and its mission is to empower every person and every organization on the planet to achieve more. . Microsoft Gulf opened its Dubai-based headquarters in 1991. Microsoft Gulf today oversees Microsoft activities in Bahrain, Kuwait, Oman, Qatar, the UAE and Yemen.